1. 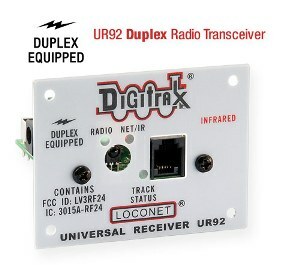 Connect the DT402D to the front RJ12 jack of any UR92 on the LocoNet. 2. On the DT402D press the opTN key and then the EDIT key. The Group Channel Numer (11-26) will now show in the lower left hand side of the display. 3. Use the Y/+ key to change to a higher channel in the available range of 11 through 26. The N/- key will change to a lower channel. 4. Press the ENTER key to update the current displayed characters as the new UR92 Duplex Group Channel. To skip making any changes, simply press the EXIT key. 5. After changing the Duplex Group Channel, your other throttless will need to rejoin to use this new Group Channel. To do this, plug your other throttles into a LocoNet port. This will allow them to update to the new Duplex Group Channel. Note: If you suspect a Wireless LAN, Bluetooth or other device is causing interference and limiting range, you can change the channelas above, and search through all available 16 channels to find one that gives best coverage.